The view from below, minus my head. With Ben's high school graduation coming in a little less than three weeks, we have been catching up on many badly-needed house projects, both indoors and out. There's nothing quite like having 50 people come to your house to get you to take a look around and see what needs work. As a result, we both have mental lists in our heads and whittle away at projects as we can. we just kind of lived with it thinking...someday. Besides, who uses that second sink anyway, right? Well, just the rest of the world, that's all. I have said many, many times on this blog that I don't consider myself "handy". On the other hand, I've said equally as many times that I don't give myself enough credit. I said it when I put the dishwasher in, I said it when I fixed our dryer belt, and I said it when I replaced our oven ignitor. It goes along hand in hand with my fear that I will try fixing something and end up messing it up worse - sometimes even requiring getting some professional to fix my fix. The thing I dreaded about this job was the cramped space. 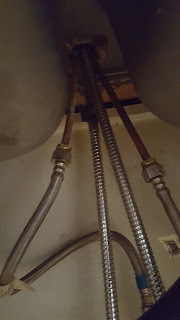 I'm a large man with large limbs, so fitting my upper torso under a sink is no easy feat. Never mind that you are laying in gunk that is all of questionable nature - chemicals and sprays, food particles and other unidentifiable crumbs. Add to that trying to manipulate stuck bolts, washers and fittings in dim light and, well. you have all the trappings of a curse fest. So I set upon my task with fear and trepidation. 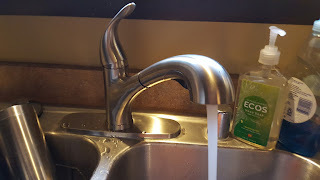 After I shut the water valves off, and unhooked the water supplies, I went about taking off what I thought were the only two screws holding the faucet. Hey, this ain't so bad, these things come off easy! Once they were off, I got out from under the sink and pulled the faucet. It didn't move. As it turns out there was a lock washer on a long, threaded brass inlet. This is where the cursing started. Because it was such a tight space and the nut was locked by deposits I couldn't budge the thing. Eventually, I told Donna to look at it. Now, she is much smaller than I so was able to get a wrench around the nut and while I twisted from above, she twisted from below. After a bit, lo and behold she said she'd loosened it. This is the beauty of a good marriage. Teamwork kicks in when one or the other is struggling. Well, after she got that loose things went much smoother. There were still some terse words at a couple of junctures, but overall, it was a piece of cake compared to what we'd just been through. When it was finished, my wife asked me why we always wait so long to do things like this that are so simple. Then we joked about how nice the new faucet was and said "This is how the rich people live!" And so it goes. I will continue to consider myself "not handy" and I will likely continue to surprise myself with projects that I successfully complete. And I will also continue to procrastinate and gripe about them for 12-18 months before I do any of them. Because that's how we roll around here on College Avenue. Haha wow, I love this man. PLEASE keep posting! Can't wait to read your next blog.This is a pretty great post. I've been thinking of starting a blog on this subject myself. Any tips or anything you would recommend me to avoid.